Ysmir Wulfharth (also known as Dragon of the North, Shor's Tongue, the Grey Wind, the Storm of Kyne, the Kingmaker, the Ash-King) was the Atmora-born High King of ancient Skyrim who came to power with the death of Hoag Merkiller at Glenumbria Moors. He submitted Skyrim to a fiery reinstatement of the traditional Nordic pantheon, destroying Alessian temples and forcing the remnants of its priesthood to seek refuge in the Heartland. He was also famed for driving the Direnni clan out of Skyrim. Legends claim that an evil god once made him (and all of Skyrim) into children, and when Wulfharth found a way to cure his people, he inadvertently made himself extremely old and died (for the first time). He led the invasion of Resdayn (modern-day Morrowind) and fought at the Battle of Red Mountain, where he was killed again. One theory to explain his unusual ability to cheat death suggests that Wulfharth was not a mere man, but one of a series of avatars sent by Shor—the Shezarrines. Arguably included among these avatars would be Hans the Fox and Pelinal Whitestrake, among others. The theory claims that Wulfharth reincarnated or recurred, as Shor's avatars are wont to do, as Ysmir, an undead warrior bent on ruling Tamriel (although some suggest Wulfharth was known as Ysmir before this). Thus was born the Underking, a title which could perhaps be attached to his predecessors, as well. The Underking assisted Almalexia in destroying the Kamal king Ada'Soom Dir-Kamal at the Red Mountain, when he attempted to conquer Morrowind in 2E 572. However, other sources say that the Greybeards summoned Wulfharth the Ash-King from Sovngarde, to fight at Jorunn the Skald-King's side against Dir-Kamal. The undead Wulfharth allied himself with a man from High Rock named Hjalti, the young general Talos, whom he granted the power of thu'um and acted as a hidden trump card and counselor. When Talos made peace with the Tribunal and accepted Numidium, Wulfharth felt betrayed and abandoned his ascendant alter-ego. Talos enlisted the help of Imperial Battlemage Zurin Arctus in ambushing and soultrapping Wulfharth (by extension, soultrapping Lorkhan himself and enabling the Mantella to serve as a replacement for the Heart of Lorkhan), thus allowing for the activation of Numidium. Wulfharth killed Zurin Arctus with his dying breath and then returned to dust. Sometime later, Zurin Arctus reappeared as a lich, and it is suspected that Wulfharth possessed Arctus or allowed him to reanimate. In any case, the new being became known as the Underking and served the interests of both fallen men, leading to the Warp in the West and the apotheosis of Tiber Septim as a god. [citação necessária] According to this theory, the three people (Wulfharth, Tiber Septim, and Zurin Arctus) can no longer be regarded as separate individuals, but part of the same enantiomorphic Oversoul that makes up the deity known as Talos. The Battle of Glenumbria Moors, after which Wulfharth is said to have to taken the throne, is dated to 1E 482, but Wulfharth's reign is said to have lasted from 1E 480 to 1E 533. 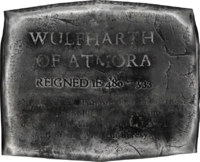 ^ a b Wulfharth's plaque in Windhelm. Esta página foi modificada pela última vez à(s) 16h04min de 10 de janeiro de 2016.